A carbon neutral home and net-zero home are similar in that both produce as much energy as they consume over the course of a year. The difference is a net-zero home produces its own energy right on the home, whereas a carbon neutral home can produce its energy elsewhere in the community. Thanks to innovative zoning, hundreds of beautiful laneway homes have been built in Vancouver, B.C. This has increased urban density and provided an affordable option for people to live in the core of a city where homes sell for more than a million dollars. In a sprawling city like Edmonton, Alberta, infill garage suites or laneway homes, are a rarity. So when we heard that Karly Coleman and Andy Hengst were building a carbon neutral, net-zero garage suite in Edmonton's Westmount neighbourhood we just had to see it. "The Garage Mahal of your dreams," says Karly Coleman, leading me through this amazing laneway home. Coleman and her partner Andy Hengst needed a new garage. But beyond increasing Edmonton's density and building a revenue-generating property, they wanted something cutting edge and green. "It has solar walls, solar panels, a thermal heat pump, really thick walls, and energy efficient appliances. It's really cutting edge," says Coleman, who strove to include sustainably-sourced flooring, paint and windows as part of the build. 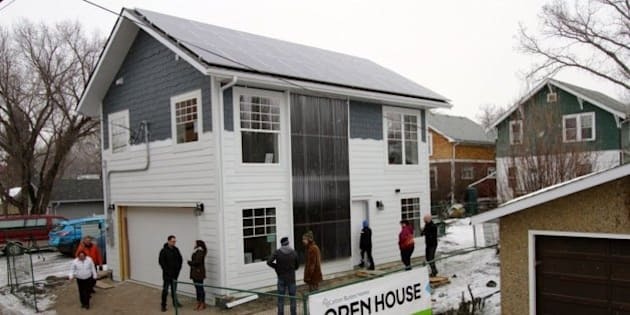 To build their dream suite, the couple hired Carbon Busters, an Edmonton-based zero-carbon design and energy-efficiency specialty firm. "Zero carbon is basically a building that doesn't emit any carbon dioxide or other greenhouse gas emissions on a net annual basis by replacing the energy with renewable energy," explains Godo Stoyke, president of Carbon Busters and author of the Home Energy Handbook. "Let's say you're in an area where you're shaded from a high rise, well, if you have a net-zero ready building, it's almost impossible to make a net-zero house in that area," says Stoyke. "But with a zero carbon, you can! Put the renewable structures on a different building or somewhere in the community." This distinction becomes important if you want to build a district geothermal heating system like the one that will be in Edmonton's planned Blatchford community, which will house 30,000 people and hopes to run on 100 per cent renewable energy. This carbon neutral garage suite is net-zero and produces its own electricity using a 6.8 kilowatt solar system right on the roof. The thing that really makes this laneway home unique is the solar-powered home heating system, which stores thermal energy in a 2,600-litre water tank to heat the home when the sun doesn't shine. It all starts with a solar air wall. We've talked about solar air walls before. We even built one! But comparing it to Karly and Andy's solar wall is like comparing a dachshund to a husky. This solar air wall is 2.5 meters wide by 5 meters tall and covers a large portion of the laneway home's south wall. A sheet of black metal material is mounted behind a wavy sheet of plexiglass, with an air space in between. "When the sun hits this solar wall, the heat gets converted to infrared," says Stoyke. "Trapped inside, [the heat] travels all the way up to the ceiling." The solar air wall preheats the air for an air-to-water heat pump, making the latter much more efficient. "In the attic, you have a fan that blows this hot air towards an air-to-water heat pump," says Stoyke. "And this air-to-water heat pump has a refrigerant that transfers the heat down to the utility room where there's a second part of that heat pump, which stores [the heat] in water. This water gets used both for space heating and for domestic hot water." The heat pumps work like your fridge, but in reverse. The system strives to keep the water in the large storage tank at 55 degrees Celsius. This stored thermal energy is fed to the water heater and directly into the home's radiant hot water heating system. The heating system runs on 100 per cent solar energy -- solar electricity for the air source heat pumps and passive solar energy for the solar air wall. The home has LED lights, energy efficient appliances (including a condensing dryer with no external vent) and high levels of insulation. "The walls are 10 inches, so it's nominally R38, which is about twice as well insulated as a regular house. The attic is R105 which is two and a half times a regular house, and the floor has insulation of over R40, where most homes have R5," says Stoyke. This project is very innovative. Stoyke has built numerous sensors into the home to make it part of his PhD research project at the University of Calgary. He hopes to learn just how much of a home's embodied energy can be offset through innovations in design. "It's called a life cycle assessment," says Stoke. "We're recording the energy it takes to make the building, the energy it takes to run it, and the energy to decommission a building at the end of the life cycle." The goal is not only to offset the energy a home uses, but to eventually turn the home into a net producer of energy. Karly Coleman wants this project to be a model and inspiration for others. "I hope this becomes the norm. I hope that technology like this, with the research that we're doing into how it's functioning and how well it functions in a climate like Alberta, both politically and temperature wise, provides information and awareness and opportunity for others to do the same thing."